ONU One is a cloud-based platform for interactive 3D product presentations on mobile devices and websites. It enables you to view products from various angles and distances, change colours and highlight product dimensions. You can zoom in or choose an exploded view to inspect details. You can explore products in action by clicking on a hotspot linked to a relevant animation; or you can swipe through an entire product catalogue. ONU One can display 3D models, animations, videos, product photos, web links, spec sheets and other product information – all on a single interactive platform. The platform works both as a personal sales tool on mobile devices and as an online solution for marketing and e-commerce websites. Your salespeople can both travel lighter and work smarter. The flexible all-in-one product platform empowers them to tailor their presentations in real time to different customer interests during sales calls, trade shows and other selling situations. Presentations run on phone, tablet or laptop, and can be projected to a big screen for a larger audience. As a configuration platform for e-commerce, ONU One allows customers to explore products in 3D and customise them in real time. Personalised product experiences help engage customers and close sales. Replacing physical product presentations with digital ones saves you time, space and money. The CAD assets you already have can be cost-efficiently leveraged to produce digital 3D replicas of your physical products for the platform. The ONU One analytics dashboard enables powerful reporting based on user activity. Everything that happens in the app is tracked and reported. You can review the numbers to find out which tactics work best and how to make your sales and marketing efforts more effective and efficient. Besides sales and marketing, ONU One can improve efficiency in training, service and design applications. In training, flat drawings or physical products can be replaced by interactive 3D models of the latest product versions. 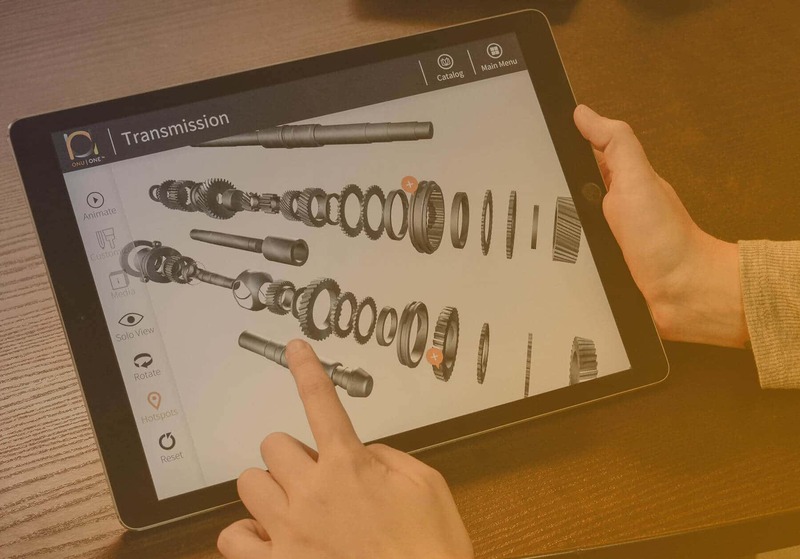 Service technicians will appreciate having interactive 3D models and up-to-date product information directly at their fingertips during service calls. Engineers and designers can conveniently showcase their work in prototype phase, prior to production – even to non-technical audiences – through highly illustrative 3D visualisation. As a member of the ONU One reseller network, Stereoscape provides complete implementation and support services for the platform. You can upload your CAD files and other digital assets via the solution portal. We finalise the visualisation of your materials where necessary. Updating existing content is easy, and updates are reflected almost instantly. All your salespersons need is to connect to the Internet and they will have the latest version ready to go. All uploads are kept secure in a cloud-based content management system. ONU One is offered via a Software-as-a-Service (SaaS) model and licensed on a subscription basis. No big up-front investment is required. Read more about ONU One.